Every coffee shop starts as some bean-obsessed dreamer's wet-eared baby, but with a lot of dedication and a little luck, some day it will grow up, earn a cast of dedicated regulars, and spawn a library of unfinished novels. Coffee shop patrons are fiercely loyal, but sometimes a new spot springs up to get the free Wi-Fi-seeking hordes' mouths frothing like a cappuccino. 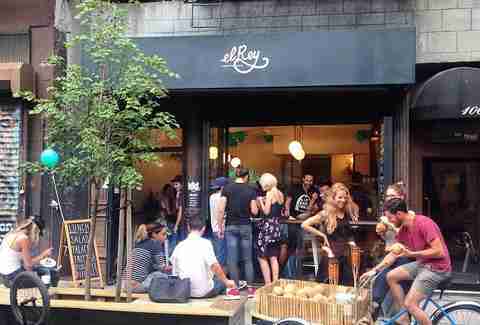 Here are 14 of the most promising shops that opened in 2013 & '14. May they live long and brew strong. What do you get when you combine a group of metal-workers, an up-and-coming rock musician, and a former Packers running back? 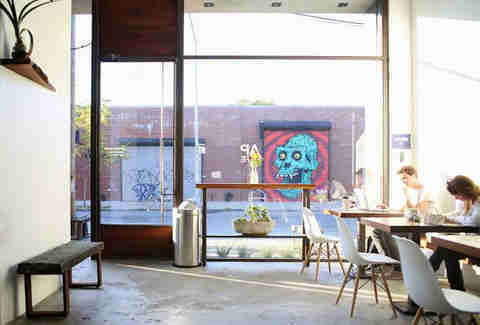 AP Cafe, a forward-thinking Bushwick coffee shop that contrasts its heavily graffiti'd block with an oasis-like vibe thanks to a squeaky-clean aesthetic and cascading water feature. They go local with the beans, the Gruyere grilled cheese sandwich is out of this world, and they designate a few tables as no laptop zones, so there's plenty of room to spread out during brunch. You won't find any chairs in Bad Wolf. Helmed by a Momofoku alum who doesn't want the shop to turn into a place to write term papers, Bad Wolf's one big communal table offers a space to throw back Four Barrel shots and dive into some of Chicago's most impressive pastries. 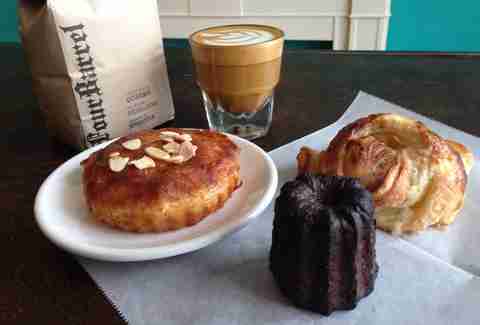 A roster of at least six different varieties of baked goods is available daily, starring a locally famous cannelé and a signature creation called the Honey Badger that combines a bear claw and a honey bun, with a bit of pan pizza dough thrown in for good measure. Jacksonville isn't a coffee Mecca, but BREW Five Points is doing its damnedest to help put it on the map. 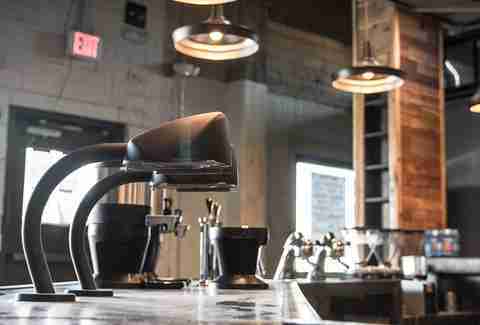 They've been rotating through a variety of Intelligentsia's finest, as well as single origins from local Bold Bean, and they've shown an interest in expanding to espressos from Texas roasters Tweed and Flat Track. The other half of the BREW equation is a sudsy one, with an emphasis on canned beers and regular tap takeovers by the likes of Oskar Blues and Jacksonville's Aardwolf Brewing. Also, they make a mean avocado toast (even if it is a little "basic"). 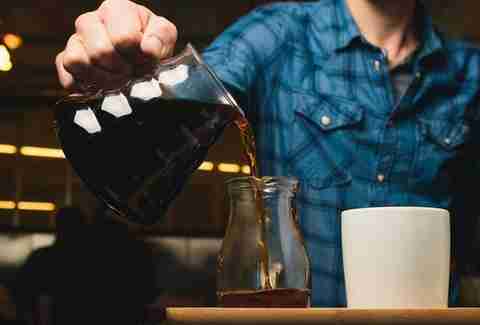 What you're getting: A cup of fruit-forward Ethiopia Cuberow, brewed with their sleek Seraphim system. Or the nitro cold-brew on draft. And a pleasant conversation. Cuvée has long been one of the roasting powerhouses in Austin's crowded coffee landscape, and in late summer 2014 they threw their hat in the cafe game. 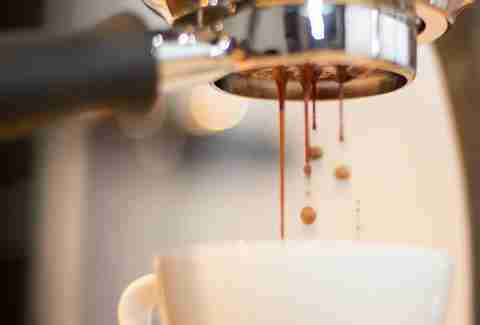 The focus is on creating a more social environment, achieved by flipping the ordering process to a brew-first, pay-last system that leads to more conversational interactions with the baristas, as well as disabling Wi-Fi to the dismay of coffee shop campers. 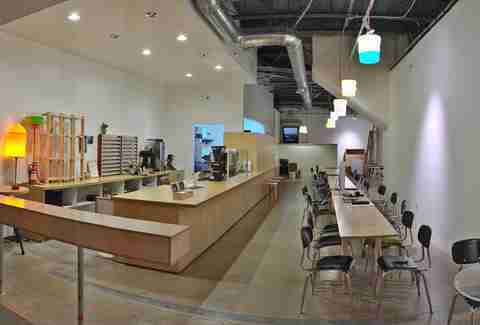 Purposefully kept sparse and simple to let the art do the talking, Document's a multi-roaster cafe and gallery space that opened in Koreatown in late summer 2014. The name stems from the owners' meticulous effort to document the life of their shop from the very first blueprints to a transparent cold-brew process that's on display in the form of slow-drip Kyoto-style brewers. Art-wise, they came out punching with a pair of gallery shows, a lecture series, and experimental electronic music performances. The beans are always changing, but right now they're brewing one of the best new roasters in America, Supersonic. This whitewashed LES outpost is seriously tiny, so don't plan on squatting, but the friendly-as-hell baristas offer a tight menu of Parlor Coffees (a micro-roaster out of Brooklyn) & beverages whipped up on a gleaming La Marzocco Strada, as well as cold coffees on tap (Vietnamese- and Kyoto-style) and a battery of local draughts. Perfect for washing down one of the best light lunches downtown courtesy of the same folks behind Morgenstern's Finest Ice Cream and recently shuttered Alphabet City destination Goat Town. 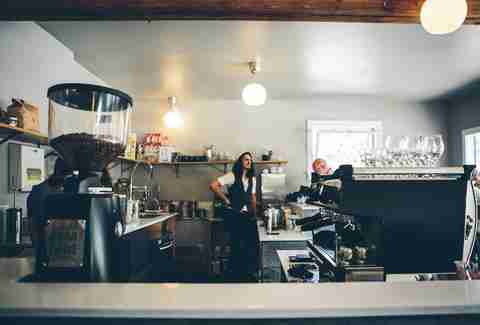 Good Coffee might be the most un-Googlable Portland spot since Beer, but what it lacks in searchability it makes up for in caffeinated comfort. 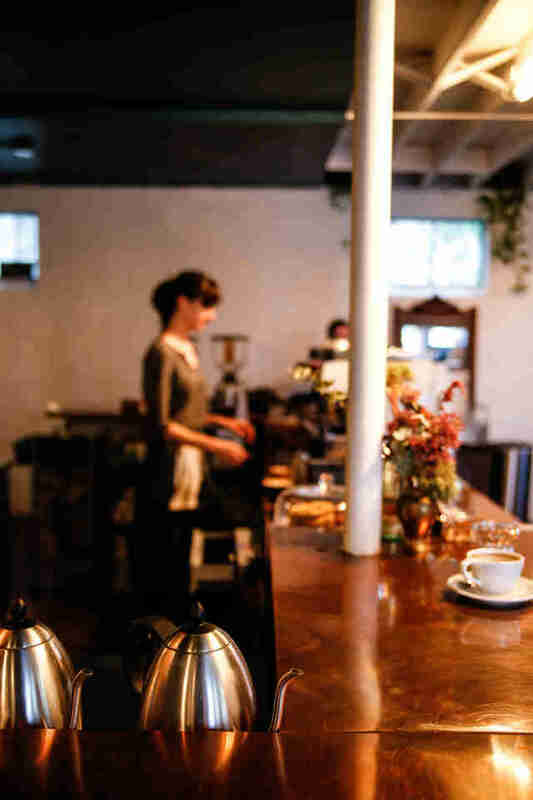 A stone's throw from the original Stumptown, Good's tiny digs -- with wall art, nooks full of succulents, and a marble counter -- are as comfy as your rich friend's living room, and the ultra-friendly baristas serve up beans from some of Portland's best roasters, including Heart and Coava, plus a crazy spicy chai from Sellwood's Either/Or. Throw in a pastry from Frice -- and, eventually we hear, sandwiches from Lardo -- and you've got a great new addition to a city that doesn't mess around when it comes to cafes. Although the other shops on this list are all cafes first, MBYC makes the exception because, well, the ocean. 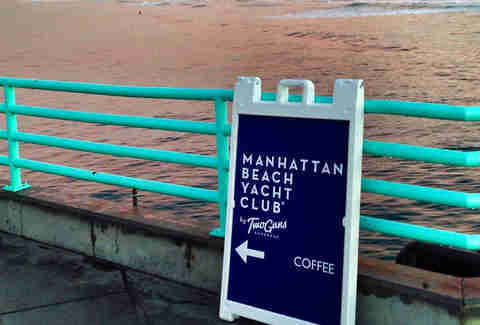 An offshoot of Two Guns Espresso, the Yacht Club is brewing hot beverages pier-side using Caffe Luxxe beans from Santa Monica. But the real stars of the show are their beach chairs and the sunsets. Method is run by the first Dallasonians (or Dallasites? Or just Cowboys?) 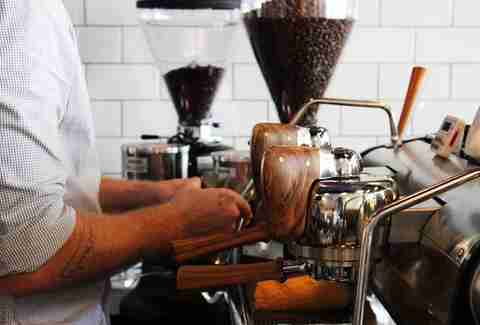 to rock a wood-grained Slayer espresso machine. 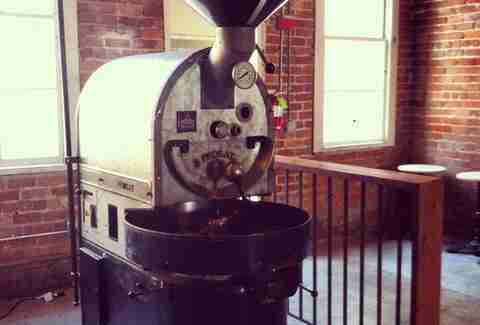 It's powered by beans from local roaster Novel, as well as monthly guests that lean heavily toward the Rockies. So far they've had Huckleberry and Corvus, which are both from Denver. The vibe is relaxed and neighborhoody, to the point that you almost feel like you're in... Austin. 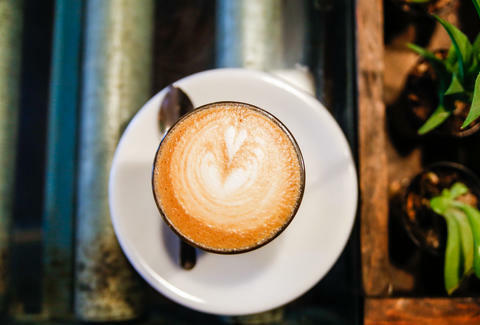 The centerpiece of Sextant might be their namesake navigational tool that sits on the counter, but the heart is a Probat roaster spitting out fresh Ethiopian beans sourced by the same folks behind Tenderloin stalwart Jebena Coffee. It's a surprisingly spacious shop that earns bonus points for having a back patio. Coffee purists might scoff, but the Jostel Gandi is one hell of a dirty chai. Slipstream aims for service to feel more like a bar, partly because it is one. In addition to a wide selection of Madcap's finest brown gold, they've got a serious dealer's choice cocktail program, and a no-holds-barred food menu with everything from lobster rolls to ramen, as conceived by a chef from one of the best ramen shops in America. They started by slinging coffee from an old Airstream trailer parked in Seattle's oh-so-hip Capitol Hill, but now Slate's got an actual coffee shop in burgeoning -- but far more family-friendly -- Ballard, where they cheerfully pour largely un-messed-with java that they roast just enough to "expose" the unique qualities of the high-quality beans they source from farms all over the world. An offshoot of the popular grab-and-go bakery SWEET, Tout Suite opened in September of 2014 in a massive 7,000sqft warehouse space that had been abandoned for 10 years after serving as an underground rave venue. The coffee is from Houston's premiere roaster, Greenway, and served as espresso, drip, and Chemex, alongside an array of sweets, savories, and a brunch menu starring a fried chicken Benedict and Vietnamese steak & eggs. Founded by a music- and coffee-scene veteran and a Local Lady We Love, Figure 8's a neighborhood shop built with a DIY mentality and an interior designer's eye. Succulents dot an old conveyor belt that's been converted into a communal table, and a wall of mirrors makes the tiny shop feel much more expansive than just 900sqft. The shop's already earned a loyal cast of regulars who give it a clubhouse vibe, where membership is just a few shots of espresso away. Dan Gentile is a staff writer on Thrillist's National Food and Drink team. He'd like to send special thanks to Figure 8 and Cuvée for putting up with an endless array of coffee questions and silly photo requests. Follow him to a stool at the counter of Figure 8 at @Dannosphere.